Even calling it pie crust is a huge stretch. I don’t like calling out recipes that don’t turn out right for me but I checked and double checked myself on this one and I followed the recipe exactly. My usual pie crust is made with butter. I love it, it’s perfect and I have no desire to ever use another. 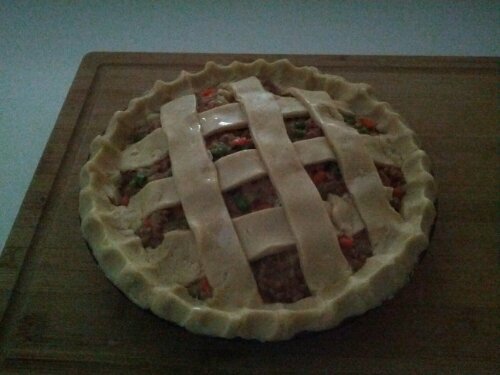 That being said, I didn’t set out to make a pie crust with this recipe… The actual recipe is for ‘meat hand pies‘ so in order to achieve the best results, I was following the recipe to a “T”. The only thing I can think that went wrong is that I didn’t chill the shortening first. I know to do this with my butter crust recipe but since this recipe is different because it’s hand held pies, I thought maybe the flakiness factor would be different (and maybe I’m wrong but I thought the chilled butter made the crust flaky). The recipe didn’t specify chilled shortening but maybe you’re just supposed to know that? This crust worked perfectly in the food processor. I drizzled the ice cold water in just like you’re supposed to and it clumped into a ball just like it’s supposed to. I took it out, wrapped it in plastic wrap and chilled it. When I took it out is when things got ugly. I tried rolling it out but it wouldn’t roll. It just tore. I tried several times with no luck so I gave up on the idea of hand held meat pies. I mashed it into a pie plate. Literally. Because that’s the only way I could do anything with it. I took clumps and pieced it all together until the pie plate was covered. I put the filling in and then, because there was no way I could cover it, I made it into strips and draped it on top. I was pretty proud of myself because even though it was ridiculous dough, I made it work. The lattice on top wasn’t correct because I didn’t weave it but trust me, that stuff wasn’t going to let me do that! I went ahead and baked it like normal, thinking regardless of how hard it was to work with, it would still taste decent. That was one meal with a lot of transformations… Meat hand pies to pot pie to meat filling with rice! Does anyone know if this is typical when working with shortening in a pie crust? Or is that what happens when the shortening isn’t chilled? Btw, the shortening I used was Crisco Baking Sticks (butter flavor). I did check the package too and it’s fresh… Good until July 2015!